This post is a review of the method invented by James Heisig, the master of Kanji (the alphabet that Japanese people borrowed from China) and Hanzi, that is the Chinese characters. The aim of this course is to help you teach yourself, as quickly and efficiently as possible, the meaning and writing of the 3,000 most commonly used Chinese characters. I only went through the first one hundred pages (you will discover later why I didn’t finish it). And I believe the book delivers what it promises. The problem is to understand what you really want. You want be the master of Chinese characters? Cool! Go for this book right now. Or you want to learn how to speak Mandarin as quickly and painlessly as possible? Because if your answer to the last question is “yes,” I’m afraid Remember the Hanzi is going to disappoint you. I think this is the reason why this book is so controversial: many people buy Remember the Hanzi for the wrong reasons, that is they believe Heisig’s system is a shortcut to learn Mandarin. They follow the book’s instructions for a while but, after they arrive to page eighty nine and are still unable to order a coffee without sugar at the bar, they start to blame Heisig. “Remember the Hanzi is useless!” they scream with absolute certainty. Well, it is not. But is not magic neither! 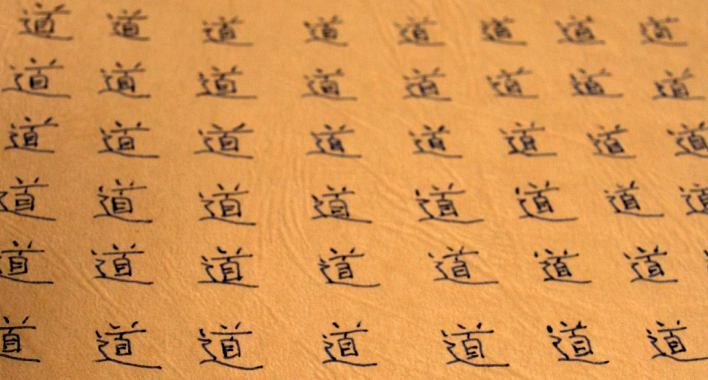 Remember the Hanzi: what is it? First at all, there are two versions of the book. Remember Simplified Hanzi deals with the Chinese characters used in Mainland China while Remember Traditional Hanzi is concerned with the ancient characters still used in Taiwan, Hong Kong, Macau and Singapore. Even if they are quite similar, in the sequel I will refer to Remember Simplified Hanzi, the one I read. The book is divided into two volumes, each one containing 1,500 Chinese characters for a total of 3,000 characters that cover about the 99,2% of the characters that you can find in a Chinese newspaper. Remember the Hanzi will teach you a systematic method to deconstruct each character into its basic elements (for instance the character 意 can be seen as 立+日+心), assign a meaning to each of these elements and invent a story to re-assemble the character so that you will remember it forever. Basically we are talking about mnemonics and reverse engineering. Ancient Greeks and Romans were already aware of the power of mnemonics. For instance, Cicero used to resort to mnemonics for remembering his long harangues. Using stories to remember any sort of things works. Period. If you want to know more about mnemonics, I recommend Quantum Memory Power, the work of the eight time memory world champion Dominic O’Brien. Coming back to Remember the Hanzi. in the first part of the book Heisig makes up the story for you. Then you are forced to invent your own stories. This is positive as mnemonics work better when you mix elements of your personal experience in your stories (people you know, places you have been and so on). Remember the Hanzi: what is not. What you will not learn here is how to pronounce any of these characters or how to combine them to form new words. 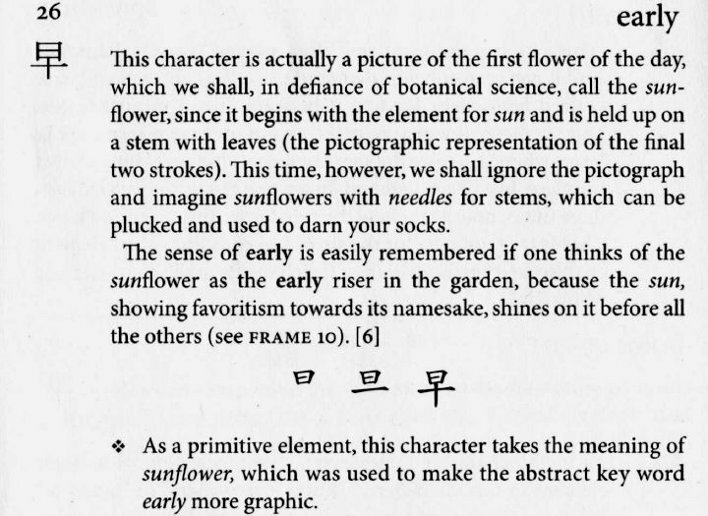 And then it goes on to explain why in Heisig’s opinion it is better to firstly learn the basic components of Chinese language, that is the 3,000 most common characters, and ONLY after to learn how to pronounce them, put them together to make up words and, finally, speak. Even if he admits Chinese people learn the opposite way (that is a natural top-down approach to the language), Heisig argues this is not good for you. I believe that the “best” method to learn a language doesn’t exist and that different things work for different people. Hence you start to rationalize that, even if at the moment you are lost among tones, stroke orders, primitives and merciless waitresses that keep coming back with a straw (xīguǎn) every time you ask for some watermelon (xīguā), you ONLY need to know the 3,000 most common characters! How tricky and misleading can be the human mind. If this was true you should already be able to speak Romanian, Portuguese, Catalan and any other language based on the Latin alphabet. Are you? Of course not everybody falls on this trap. I didn’t do any surveys but my guess is that the more you have an analytic mind the more you are exposed to this mistake. That is German people, engineers and few others are in a great risk (I know, bad joke). More ambitious people will opt for twenty or forty characters per day so that they can master Chinese language in six or three months, respectively. Then you open Remember the Hanzi and start to learn characters. The first days everything goes well. Using mnemonics is great fun, Heisig made up the stories for you and you are able to learn much more than ten characters per day. And then you start to fantasize you could master Chinese language in three months, no need to wait a whole year! “A whole year in order to master Mandarin? Tzzz, this is for losers!” you will reckon. But after a couple of weeks you realize that all these stories you are learning are not really helping you with your main goal, that is being able to understand and speak Chinese. Sure, they are helping you to remember the meaning of SOME characters, but this is not what you need right now. You want to speak Chinese after all, don’t you? You need to understand what the waitress or the hairdresser is asking to you so that you don’t end up eating chicken feet or with Jacky Chan hair style (I’ve been there). And then you start to blame Heisig and give up with mnemonics, stories and maybe even characters whatsoever. Remember the Hanzi is not a black magic book nor a shortcut for learning Mandarin. It is merely a tool that will help you to remember and writing Chinese characters if you will be persistent enough to go through all the 3,000 stories you will need. If you are new to this blog and you want to know how I’m trying to learn Chinese, check this post. At the beginning of July I purchased a Chinesepod subscription. Currently I’m listening to a podcast per day. I kept doing my Anki flashcards (ten new cards per day more the daily review of old cards). I kept watching a Chinese movie per week and listening 100% of Chinese music on my iPod for the first twenty days of July while I didn’t watch any movie the last ten days because I’m traveling. Keep my daily SRS revision sessions and continue the fourth deck of Anki cards (ten new cards per day). Keep listening to ChinesePod (at least ten new podcasts per week) and watch a Chinese movie per week. Build an Anki’s deck with all the interesting sentences I find on the Rocket Chinese course and on Chinese Pod. The goal is to end up with a deck of three hundred cards at the end of the month. One of the objectives of July was to start this deck (one hundred fifty cards) but I kept procrastinating till it was time to leave for Vietnam and I ended up failing this goal on July. This is not a big deal as long as I catch up in August. I dont really agree with your main point here, but I also dont really agree with Heisig about deliberately not starting learning the spoken language until finishing rth. The conclusion I came to was to seperate the characters I was learning into two types, first being the characters learned in rth: deep full knowledge of the character and its relationship with other characters through components (often an overlooked feature of the book, and in my opinion more important than the mnemonics). second was learning everything I could “in the wild“ where I had the opposite approach of just picture recognition. After a month of rth the overlap was really noticeable where I was running into characters from rth in my extensive reading, and running into characters from my reading in rth. I dont think either method would work as well alone as they worked together for me. after years of writing this, I came to conclusion that different things work for different people. Some people are more analytic and learn better with a structured system like for instance Remember the Hanzi, while other my fail big time with this (or similar) system because they get bored to death after 2 days. I have tried ‘remembering the kanji’ I think this is a really good review of that book. I persevered through the whole first book mostly because I found inventing new mnemonics and testing my memory more fun than any other kind of study so I used my study time that way. But I admit the usefulness wasn’t proportional to the effort for my two years in Japan. Once it got me out of an automated hotel though! And great for impressing the locals. Now I’m turning my attention to Chinese and I think i’ll go through this heisig method all over again because of the same reasons. Even when I know it isn’t going to be very useful on its own! I am interested in the other ways you have of learning though. Do you get your movie/music/flashcard words from talking to chinese people? Any solid movie recommendations? The only chinese song I’ve found that I’ve liked is “one night in Beijing” I imagine you know the one. Again, you nailed it for people deciding whether or not to invest in this. Best if you’ve got some time to study before traveling and enjoy the process, not so good for the people who just arrived in China and are looking to survive. if you enjoy Heisig method, then you shall definitely go for it! However today there are software like Skritter that are way superior (you find a review here on the website). I also published an article with my 7 favorite Chinese movies; you can use the search bar on the top-right corner to find the articles! I’m using the Kanji version of Heisig’s method, but I do find it a big help in learning Japanese. Doing RTK won’t teach you Japanese, but if you do study Japanese as you do Heisig, you’ll immediately recognise lots of kanji in the vocabulary you learn, which makes it stick and takes the pain away from learning the readings. I think “I’ll master Japanese in 3 months if I do Heisig!” it’s a bit of a straw man argument because you shouldn’t expect that from it! It’s just a way of being done with the kanji hurdle when you’re a beginner and still learning the kana, so you can focus on other, more important things later on. Yup, many people think they will speak Japanese (or Chinese) after they finish the book. This article states that this is wrong. Interesting post! I actually used RTK (Remembering the Kanji) to learn about ~2500 characters while I was studying Japanese. It was a great help and it allowed me to learn Japanese much faster than I might have otherwise. The really cool thing is that I was then able to go to China and I was immediately able to read and understand 80% of what I saw. This motivated me to start seriously studying Mandarin. Of course, I need to learn pronunciation, grammar, compounds, and all of that stuff just like anybody else… But having the knowledge of 2500 characters in my back pocket has proven to be a huge advantage in my Chinese language study. I have access to a much wider variety of learning materials compared to somebody going in with no knowledge of Chinese characters. Anyway, just thought people might find that interesting! yes, it shall be way easier if you already know the characters! LU XUN: Hanzi is Beat Writing.. Primative, Barbaric, Ugly..
Lu Xun: either Hanzi dies or china dies. Mao Zedong wanted to get abolish, one and for all. primitive, barbaric Haniz. You have made some very good points in your post. I agree there is no magic bullet for learning hanzi. I too use SRS for learning I tried Anki and didn’t like it. I did try Skritter and much prefer it. I like the tracking that it offers. When I first start learning a set of characters or vocabulary I use Quizlet. As I am enrolled in a Uni. course we learn about one lesson of NPCR every two weeks. So this keeps me moving and I still try to only learn what I am going to use. Though this does not always work and I occasionally have to learn something that I would not use outside of the text or course work. I also print character sheets for the rare occasions I don’t have a computer or iPad to do thing online. I have not done this recently as I find Skritter is enough. I do have a large collection of Chinese course texts, Chinese Grammar books and Hanzi books. I prefer ebooks now. There is a similar book from Tuttle called Learning Chinese Characters. It has a method of mnemonics that differs to any other text that I have read. I quite like this method but do not use it often. thank you for reading. Yes when you are studying a language at the University there will always be stuff you are forced to learn even if you don’t think it’s important. I didn’t try Skritter yet because it seems more focused on learning how to write and I’m not at that phase yet. I do plan to subscribe this fall and try it out.